I promised you the lamb recipe from my Greek-themed birthday celebration a couple of weekends ago, so here we go! My first advice? Have the butcher remove the leg bone and butterfly it for you. A lamb leg bone is actually horseshoe in shape, and is very tricky to remove without, pardon the pun, totally butchering the meat. 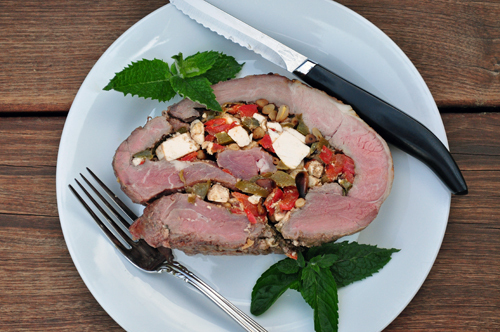 The filling for the lamb consists of sauteed red and green peppers… …mixed together with feta cheese, ricotta salata cheese (or use all feta if you can’t find this), and toasted pine nuts. (I know these look a little burned. Although I often burn the first batch when toasting them, my husband was supposed to be watching these for me so for once it wasn’t my fault!) 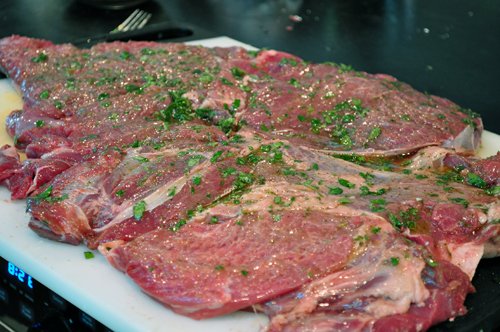 Lay the butterflied leg of lamb on a board and rub the inside with the red wine vinegar, oil and oregano mixture. I actually used a meat mallet to hammer this a bit with the tenderizing side a little bit before putting the run on. My roast was still a little tough and in the future I think I would double the rub ingredients and actually marniate the leg of lamb for 24 hours to help tenderize it. 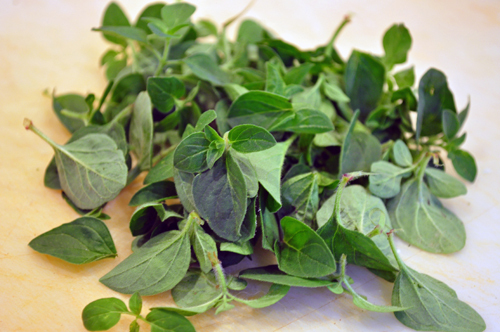 By the way, oregano or marjoram are perennials and using fresh herbs in this recipe makes a difference. 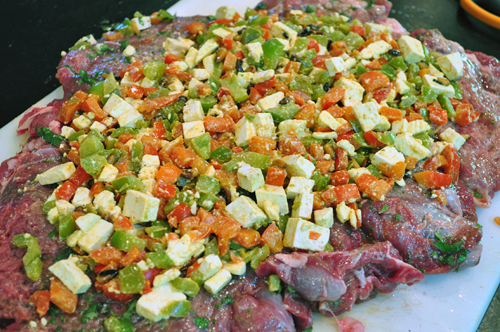 Spread the stuffing mixture over the top of the butterflied leg of lamb, keeping a clean margin on all sides. Carefully roll up the meat, tucking in the ends to keep the stuffing from falling out, and tied the length of the roll with kitchen twine. Roast the leg of lamb at a high temp first to form a crust on the outside, then reduce the heat and keep roasting until the internal temp reaches 130 degrees. 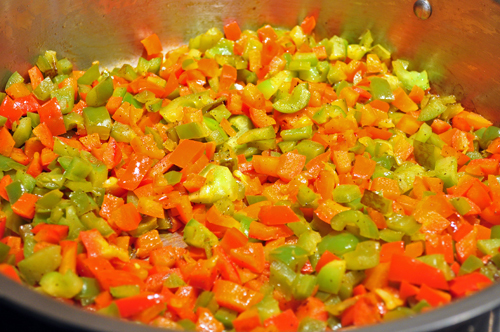 Let stand for at least 15 minutes before carefully slicing and serving. Combine red wine, oil, sea salt, pepper and oregano and rub all over leg of lamb. 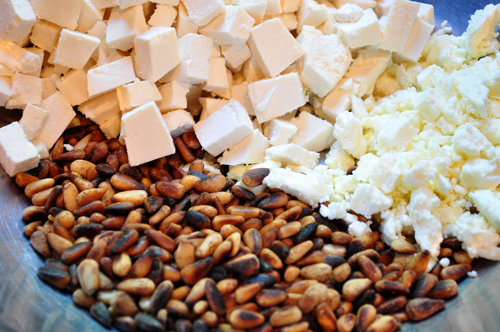 Combine peppers with cheeses and pine nuts. 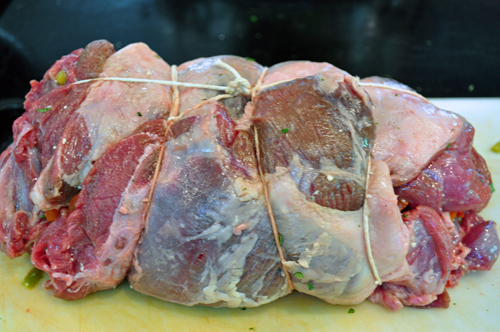 Lay lamb fat side down and spread the filling across the meat, leaving the edges clean. Roll into a jelly roll and tie with kitchen twine. Make a bed of chopped vegetables in a large roasting pan and set the lamb on top of the vegetables (or on a wire rack above the pan), fat side up. Roast at 450 degrees for 20 minutes. Reduce heat to 350 degrees and continue to roast until the temperature reaches 130 degrees, about 1 to 2 hours depending on size of the roast. Let meat rest before slicing. Serve with mint leaves for garnish. 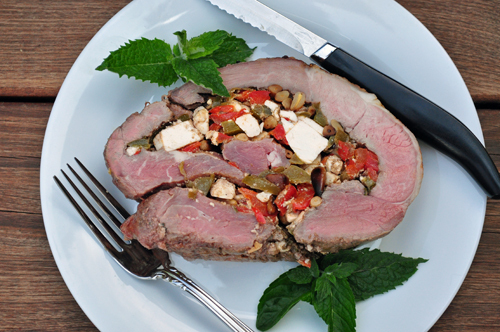 I get a boneless leg of lamb from Costco and use it once a year for a Christmas dish we love. This looks good enough I think it’s time I tried something new. I’m not a fan of green pepper but assume I could leave it out. Do you grow your own herbs? Because I have plenty if you need some when you’re here. The oregano is actually a bit out of hand and I seem to have enough tarragon for an army!